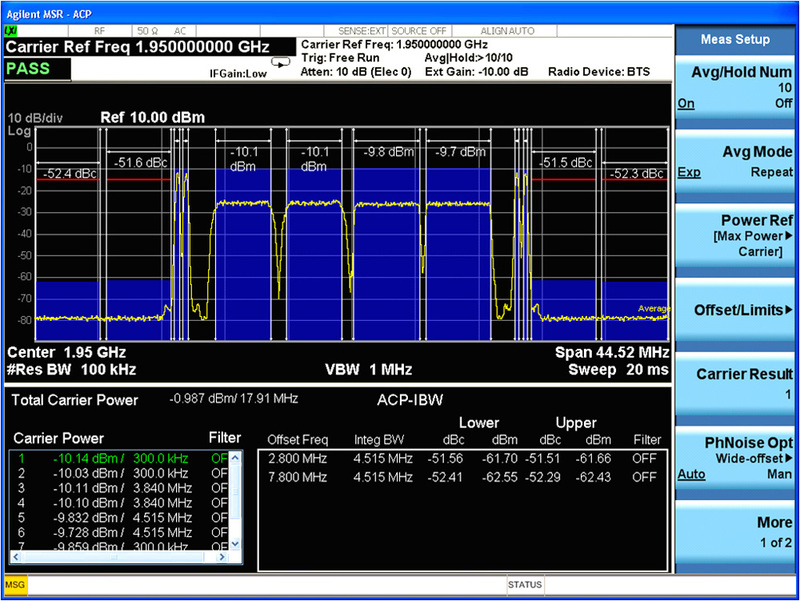 MSR adjacent channel leakage power ratio (ACLR) measurement of a combined GSM/EDGE + W-CDMA/HSPA + LTE-FDD signal. Agilent Technologies Inc. (NYSE:A) has introduced the Multi-Standard Radio measurement application for its X-Series signal analyzers. Ideal for engineers manufacturing base stations and base-station components, the MSR measurement application enables one-button, standards-based testing per the RF requirements defined in the TR 37 series of the 3GPP Release 9 standard. It is the first and only 3GPP-compliant one-button measurement application on the market today to quickly and easily manufacture MSR base stations and base-station components. Agilent's new MSR solution can be used to measure the FDD MSR scenarios for both band category 1 and band category 2. As such, transmitter testing can be performed on any combination of GSM/EDGE/ EDGE Evolution, W-CDMA/HSPA/HSPA+ and LTE-FDD signals. Supported standards-compliant measurements include error vector magnitude, frequency error, spectrum emissions mask, adjacent channel power and more. A carrier-allocating algorithm with preset selection based on the test configuration definitions in the TS 37.141 standard, plus predefined test limits, eliminates the need to manually define test parameters, further simplifying the measurement process. Moreover, the measurement application's inherent flexibility allows the user to change test parameters as necessary. "The coexistence of LTE, W-CDMA/HSPA and GSM networks, spectrum fragmentation and the need to reduce costs are some of the key factors driving development of MSR base stations and, in response, the need for a dedicated MSR measurement solution," said Guy Séné, vice president and general manager of Agilent's Microwave and Communications Division. "Our first-to-market 3GPP standard-compliant MSR solution extends our leadership in the cellular communications market by specifically addressing these needs." The new measurement application is part of a common library of more than 25 measurement applications within the Agilent X-Series. The X-Series is an evolutionary approach to signal analysis that spans instrumentation, measurements and software. As an X-Series measurement application, MSR software can be easily transferred between X-Series signal analyzers with transportable licensing. The new N9083A/W9083A MSR measurement application for the X-Series signal analyzers is currently available through an early access program. More information on the MSR measurement application is available at www.agilent.com/find/MSR. An image of the new measurement application is available at www.agilent.com/find/n9083a_images. Agilent will demonstrate its new N9083A MSR measurement application, along with the MSR signal generation capability now available with N7624B Signal Studio LTE FDD software at the 4G World Conference, Oct. 25-27, at McCormick Place, N. Building, Hall B1, Booth 819, in Chicago.